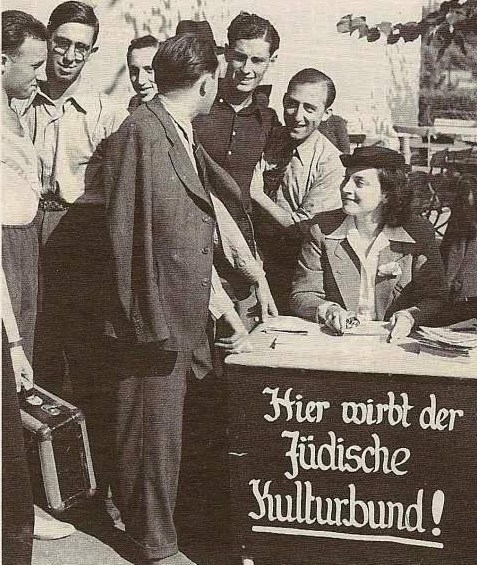 Michael Haas has written a fascinating paper on the Kulturbund, the cultural organisation that arose in Hitler’s Germany when Jews were banned from general musical activity. Some of the recordings here are sensational. Story/history of the Juedische Kulturbund was told at some length in Martin Goldsmith’s excellent book The Inextinguishable Symphony published in 2000. A wonderful book. Captivating from beginning to end and should have had a huge audience. Martin Goldsmith’s book The Inextinguishable Symphony is indeed the easiest place to start in reading about the Kulturbund. It is the story of his own family, his father and mother being young musicians who were members of orchestras (in Frankfurt and Berlin) in the Kulturbund. The title of the book has a double meeting. The very last work performed by the Kulturbund was Nielsen’s “Inextinguishable Symphony”. Goldsmith’s grandfather and uncle were on the ship St. Louis. When the ship was forced to return to Europe, his grandfather and uncle were allotted to France and eventually died in Auschwitz. Goldsmith has written a second book–Alex’s Wake: a Voyage of Betrayal and a Journey of Remembrance–that goes into great detail about what happened to his grandfather and uncle. A more scholarly book about the Kulturbund is Lily E. Hirsch, A Jewish Orchestra in Nazi Germany. Musical Politics and the Berlin Jewish Culture League (University of Michigan, 2010). There is a substantial literature in German, some of which is mentioned in the article by Michael Haas that Norman cites. Michael Haas has his own book–Forbidden Music. The Jewish Composers Banned by the Nazis (Yale, 2013)–that includes material about the Kulturbund. The Kulturbund was about more than music. There is this book by Rebecca Rovit, The Jewish Kulturbund Theatre Company in Nazi Berlin (University of Iowa, 2012). It is surprising that this was economically sustainable in an environment where only Jews were allowed to attend the concerts and yet Jews were banned from the well-paying occupations that would create the disposable income to buy tickets. And now we have neo-Nazis marching and chanting “Jews will not replace us” right here in the good old USA…..
Not to mention the significant rise of antisemitism in Europe and the UK. Who refuses to take notice of history is doomed to repeat it again and again. They’d have to be taught and know history to begin with and I don’t see much evidence of this in the postmodern academy. I am lost for words. What an amazing, tragic story and wonderful collection of musical samples. There is certainly more than one composer new to me here that I need to learn more about. Thank you Michael Haas.